Colleges are more competitive than ever while the application process has become more cumbersome. At our College Admissions in the 21st Century program on December 6th at 7:30 pm Hanna Stotland, an admissions consultant, will offer parents and high schoolers an overview of the college admissions process and how students can find the right path. The program will present the latest advice on standardized testing, essays, campus visits, how to choose once you’ve got your acceptance letters in hand, and more. Bring your questions! Whether or not you attended our first Michelangelo program in July, you'll want to make sure you come to our next one on Monday, December 5th at 7:00 pm. In this program, entitled Michelangelo's Paintings: Process, Patronage and Subjects, art historian Jeff Mishur will return to focus on the paintings of this Renaissance master. 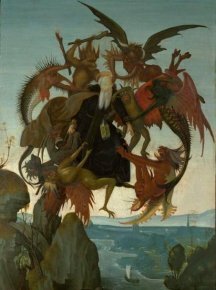 He will talk about the iconography of the works as well as patronage, while discussing works including the Temptation of St. Anthony, the Sistine Chapel and The Last Judgment. If you haven't tried one of our art programs, this one is definitely not to be missed! The library will close at 5:00 on the Wednesday the 23rd and will stay closed on the Thursday the 24th. We will reopen on Friday the 25th. We hope you all have a wonderful holiday! Do you realize how much the Friends of the Glencoe Library contribute to the library's programming and services? They sponsor the concerts, book sales, and summer and winter reading programs. They allow the library to offer great online services like Consumer Reports and Ancestry. They enable us to offer Monday Night at the Movies, Talking Pictures and other great entertainment to you and your neighbors. They even pay for improvements to the building and landscaping. Do you want to learn about how you can conserve energy, recycle, and create less waste in your home? Come by the Takiff Center, at 999 Green Bay Rd., on Saturday, November 12 from 10:00a.m. - 1:00p.m. for Glencoe's first ever Glencoe Goes Green event! Area organizations (including the library) will be represented at this event, which will include interactive booths and displays for all ages. Admission is free and you can find more information at the Glencoe Goes Green website. Are you a big fan of Christopher Paolini's Inheritance cycle (Eragon, Eldest and Brisingr)? Come to our book group / pizza party taking place on Wednesday, November 9th at 4:00 p.m. where we'll talk about the first 3 books to get you ready for Inheritance, Book 4 in the cycle. Please make sure to sign up beforehand at the Reader's Services desk so we know how much food to provide. This discussion is for 6th to 12th graders only. We'll see you there!